The U.S. Supreme Court largely rejected Attorney General Greg Abbott’s challenge of federal climate rules Monday, deciding that the EPA is allowed to regulate greenhouse gas emissions from most large industrial facilities. The latest loss for Texas in its ongoing campaign against the federal government and the U.S. Environmental Protection Agency came Monday, when the U.S. Supreme Court largely dismissed Attorney General Greg Abbott’s challenge of federal climate rules. Seven justices agreed that the EPA is allowed to regulate greenhouse gas emissions from most large industrial facilities, like power plants and factories. Texas and an industry coalition had argued against the rules. What exactly were the regulations that the Supreme Court examined on Monday? The regulations concern permits that companies need to build large industrial facilities, or to expand existing ones. For decades, facilities that emit a lot of “conventional” air pollutants, like sulfur dioxide or nitrogen oxide, which harm air quality, have had to get permits. Under new EPA regulations, the permits would also apply to greenhouse gas emissions, which scientists say are warming the planet, with devastating effects. Since companies can’t start building until they get these permits and explain how they plan to control such emissions, they’re a powerful tool for the federal government to regulate greenhouse gases. The EPA says hundreds of facilities will need to get the permits every year. Are the regulations a big extra cost for business? That’s up for debate. Texas has argued that the regulations will result in job losses. The EPA argues that big facilities have always needed federal permits for emitting conventional air pollutants anyway, so the rules change is really nothing new. But the regulations have caused headaches in Texas, because the state refused to cooperate with the EPA, leaving in limbo dozens of planned new industrial facilities that needed permits. Texas recently agreed to begin following the rules. Why did Texas challenge the rules? Texas, along with an industry coalition that included coal and power companies, argued that the EPA isn’t allowed to regulate greenhouse gas emissions because the Clean Air Act only explicitly allows it to regulate conventional air pollutants. Congress never included greenhouse gases in the Clean Air Act, Texas argued. If the Clean Air Act doesn’t explicitly mention greenhouse gas emissions, how can the EPA regulate them? That question is at the center of the challenge by Texas and other states, which argue against nearly all of EPA’s climate regulations. Since Congress has refused to pass any climate change legislation, the Obama administration developed a workaround: A once-obscure provision of the decades-old Clean Air Act says the EPA can regulate known air pollutants and unknown “pollutants of the future.” In 2009, the EPA decided that greenhouse gases like carbon dioxide fit in that category. Doesn’t that settle the debate? Not exactly. The Clean Air Act doesn’t simply say that the EPA can regulate air pollutants like sulfur dioxide, mercury and lead. It also sets thresholds for them — meaning, for instance, that a power plant can only emit 250 tons of mercury a year. The limits for pollutants tend to fall around 100 and 250 tons per year, and exceeding them results in penalties. Why not use those limits for greenhouse gas emissions, too? If those limits were applied to greenhouse gas emissions, everything from a gas station to a school building might suddenly need federal permits. To avoid that, in 2010, the EPA issued a “tailoring” rule, which allows the greenhouse gas permit requirements to apply to only big facilities that emit much more carbon pollution — more specifically, around 100,000 tons of carbon dioxide per year. That “tailoring rule” is what Texas challenged in its lawsuit against the EPA in this case. Abbott argued that the EPA did not have the authority to tweak the numbers and thresholds like it has in the tailoring rule. What was the EPA’s defense? The EPA broadly argued that the obscure “pollutants of the future” provision of the Clean Air Act gives it the authority to regulate greenhouse gas emissions, along with the landmark 2007 Supreme Court case, Massachusetts v. EPA. In that case, a group of Northeastern states sued the agency for not regulating greenhouse gas emissions, and won. What did the Supreme Court say about all this? The justices were divided on the various points. A majority of the justices (seven out of nine) said that the EPA can regulate greenhouse gases from large facilities, as long as those facilities also emit large volumes of the conventional pollutants that the EPA has long regulated. If the facility only emits large amounts of greenhouse gases, the permits aren’t allowed. Abbott hailed that portion of the ruling as a victory, but few, if any, facilities would be let off the hook by this exception. He said the ruling was "a great victory for the rule of law and for the Constitution." Five out of nine justices also ruled that the EPA’s “tailoring” of the Clean Air Act is not permissible. But because the court ruled that the agency can regulate facilities that already emit large amounts of other pollutants, the "tailoring" rule isn't needed to limit greenhouse gas emissions from those facilities. The ruling on Monday brings an end to the last of Texas' major challenges to the Obama administration’s climate rules. The court has rebuffed all of the state’s other challenges, including the “tailpipe rule,” which allows EPA to regulate greenhouse gas emissions from vehicles, and the “endangerment finding,” which was the agency’s decision that greenhouse gases are dangerous pollutants that deserve regulation. More challenges are sure to come from Texas, though. The administration has already introduced rules limiting carbon emissions from new power plants, and has proposed rules limiting them from current power plants. Gov. 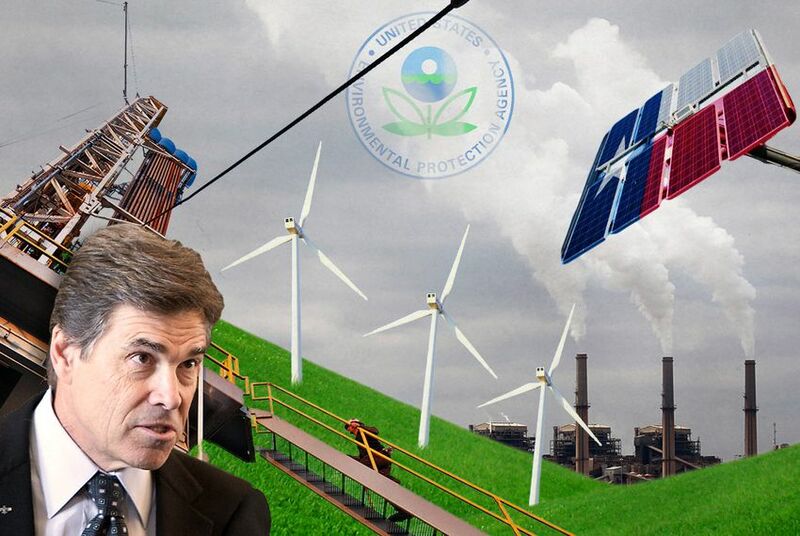 Rick Perry has suggested that the state may sue over those rules.